In this role you will manage the interactive resources in your centre. You will ensure teachers are trained and supported in using technology in the classroom and ensure a high level of customer service and student satisfaction. Supporting teachers with the use of iPads and interactive resources. Routine maintenance of iPads and technological equipment. Facilitating the uploading of student projects to EF’s video competition website. Assisting the Academic Manager when timetabling iPad or netbook lessons. Assisting teachers when answering technology orientated questions. Ensuring IT facilities are set up and fully functioning in your Centre. Proficient with Apple products and general IT. Attend training prior to your contract commencing. Interested applicants should send their CV to noel.harmsworth@ef.com or apply online at www.ef.com/maltajobs . Do not hesitate to call me on 99440909 for more information. Due to an imminent induction programme for all prospective summer employees it would be ideal to receive any applications by Thursday 24th April. If you or someone from your friends are looking for a new job, the company I’m currently working with are looking for a software developer. If you’re interested just send me an email or contact me on skype ‘cpb089’. IBIS Group Ltd has been established for the past 10 years and has been providing I.T. servicing to a vast spectrum of corporate clients. The services provided mainly consist of support, repairs and sales of computer hardware, IT software and Networks. 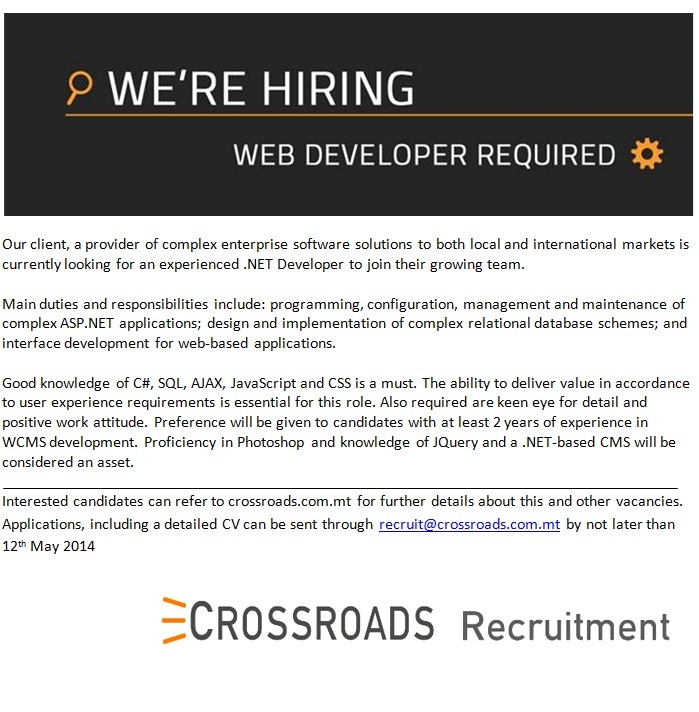 We are looking to expand our team once more and a vacancy for an I.T. Technician has arisen within our company. A good hands-on technical aptitude and a thirst to learn, improve and deliver are key aspects to the job. A valid driving license and own means of transport are also required. Applicants are invited to submit a detailed CV with a covering letter to Lorna Debono at lorna@ibisgroup.eu by Friday 4th April 2014. Applications will be treated with the strictest confidence and acknowledged after closing date.